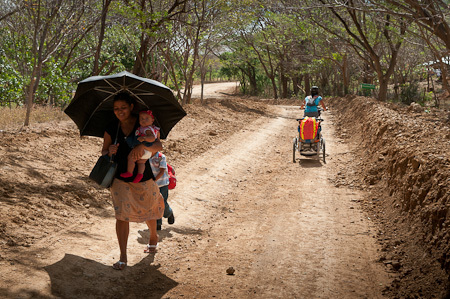 Megan towing her little offspring, Neva, on the backroads of the Nicaraguan Pacific coast. 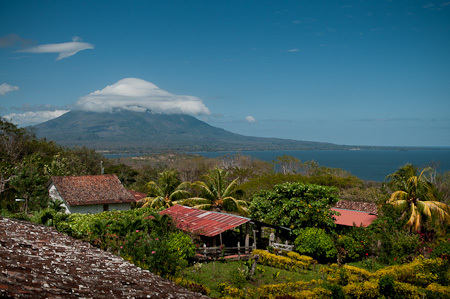 Our visit to the idyllic, peaceful island of Ometepe yielded a camp spot with this incredible view. 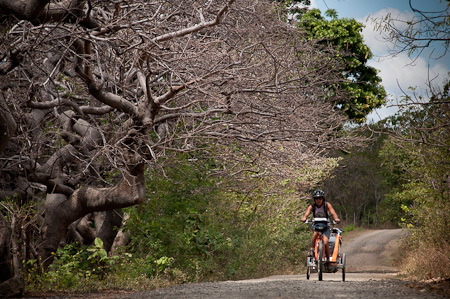 If you're headed that way, check at the organic coffee farm, Finca Magdalena in Balgue. 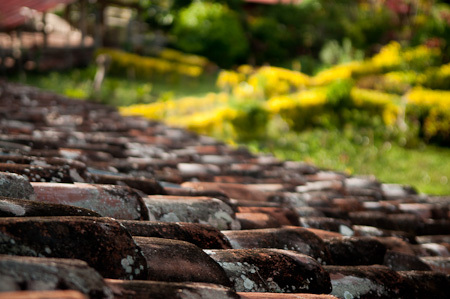 With its dappled, moss-stained terracotta tiles, we might have been in a rural village tucked away in Tuscany. 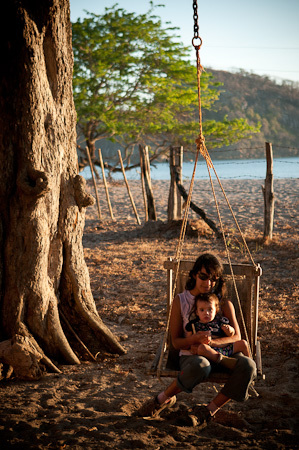 Central America is prime hammock swinging terrain. And in Neva's case, a good opportunity to develop those useful baby climbing skills. 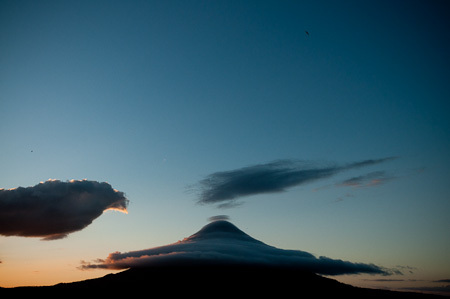 The view from our next camp spot: the perfect upturned funnel of Volcan Conception, with its early evening nightcap of wispy cloud. Uh oh. Neva makes a run for it while Megan's attention is focused on pitching their tent. At fifteen months old, she's still honing her walking technique. Towards the end of the day, when tiredness creeps in, it's known as Drunken Style. Expect some rough backcountry roads away from the main highways. 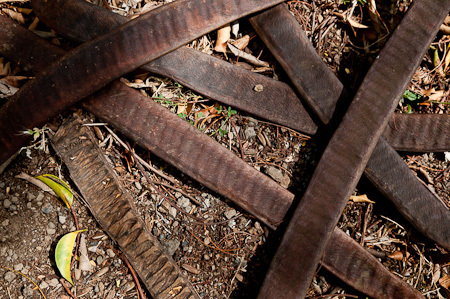 Nothing the Chariot couldn't handle, though with its nifty weight adjusted, leafspring suspension. It's no wonder this is the Range Rover of trailers. 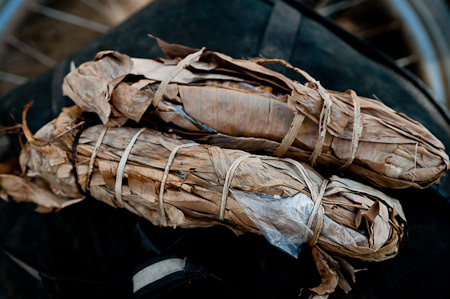 The food that kept us riding. 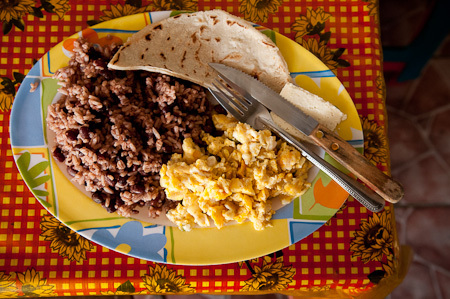 This is a typical Nicaraguan breakfast. Gallo Pino is precooked rice flecked with beans and spices. Hence the name: Speckled Hen. Other roadside delicacies - unfurling these dried leaf wrappers revealed a sugary treat embedded with peanuts. I'm used to stopping and mixing up a sachet of isotonic powder to keep me going. This last week, it's been about pulling over to mix up a bottle of baby milk. That one's a new experience. 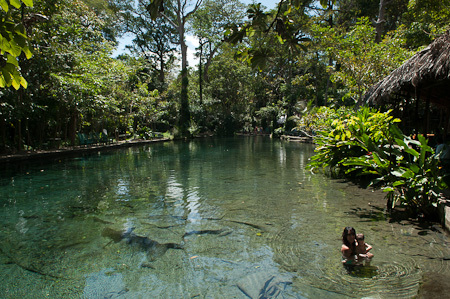 Neva and Megan cooling off in the calming, healing waters of Ojo de Agua. 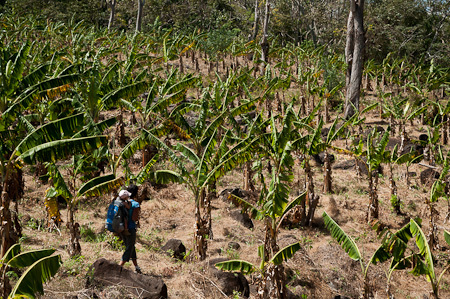 We also took some time out to hike a trail leading to an organic coffee plantation, using the Deuter Kenga Kid II, a packpack that expands like an accordion to hold a baby. Taking a break amongst compartmentalising roots of these mighty trees. 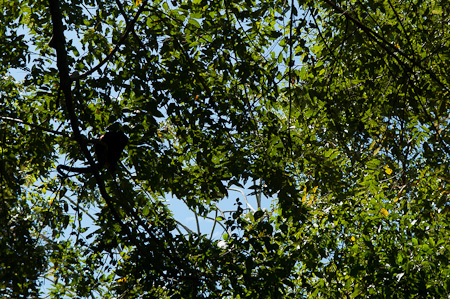 We saw sloths, heard howler monkeys and chased big, bright blue butterflies, that flapped around us with clumsy grace. 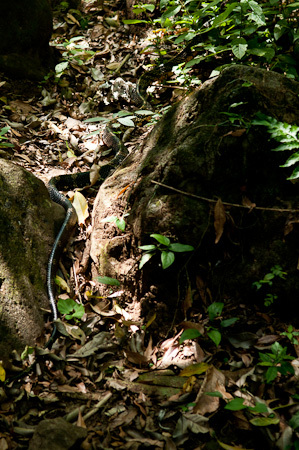 As well as this two metre snake, that shook its rattle at us before slithering off into the undergrowth. These seed pods that made great rattles for Neva. 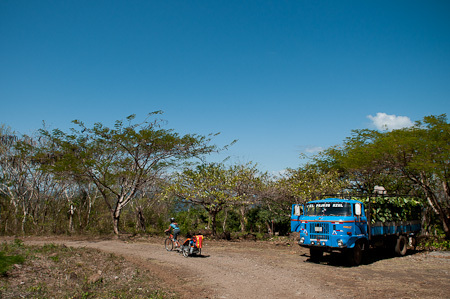 One of Ometepe's perfectly preserved, timewarpped trucks, loaded up with a fair few meals worth of tasty plantanes. Here she is, after a particularly gnarly section of trail. Her bottle worked itself free from her kung fu baby grip, but that was about it. 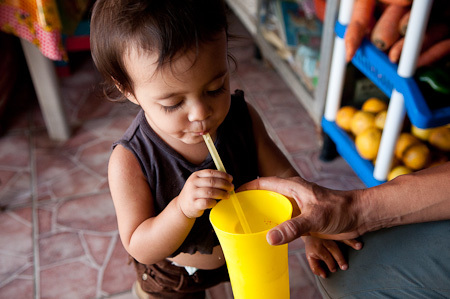 Whenever we passed other families, we would exchange knowing little smiles. School children ran alongside us to peek inside the the trailer, marvelling that there was a baby inside. 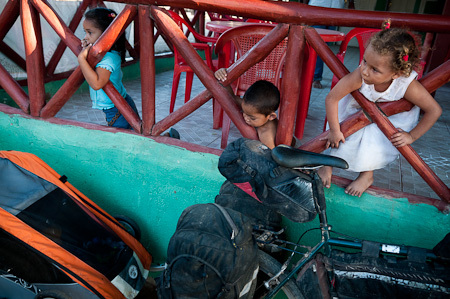 Motorbikes doubled back to check us out and chat on the move. Everyone waved. Celebrity status: checking out the trailer and its contents. Some helping hands up those steep island inclines. 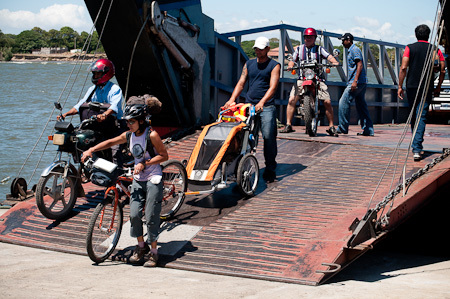 And off the ferry - El Che - to the mainland once more. Reaching the Pacific Coast at Playa Gigante, a quiet backwater beach known only to surfers for its nearby breaks. 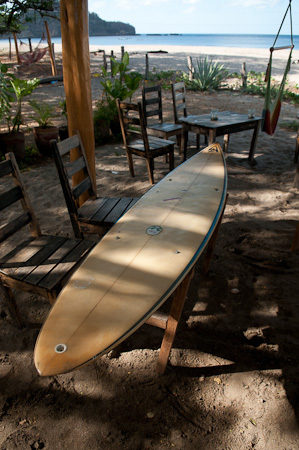 We camped beside a surf shack that served up a mean portion of fish tacos, on groovy tables made out of surfboards. A dirt road, via Chocolata, lead us to this funky coloured guesthouse in San Juan del Sur, the main tourist hub in the area. 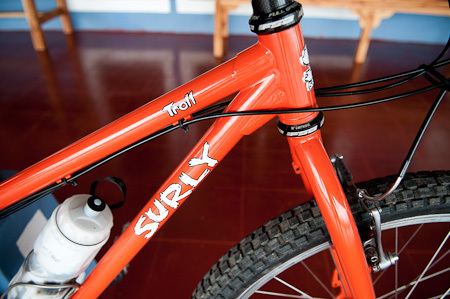 Megan is loving her petite Surly Troll, by the way. And that 'Agent Orange' finish goes nicely with the Chariot too. Thanks Stuart at Bike Shop Hub for putting it all together with such expertise. 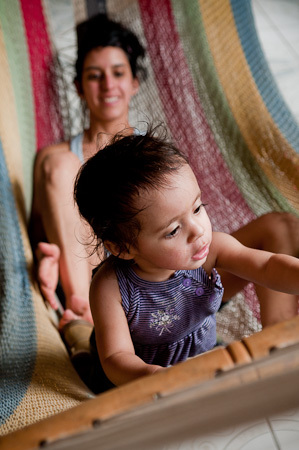 Several families have embarked on inspiring, adventurous trips with their offspring across Latin America – like these guys. Our mini tour has certainly opened up my eyes to the possibility of travelling this way myself one day. We didn’t end up covering as much ground as we’d planned, partly due to over optimistic planning, and partly because Megan was still recovering from a virus she picked up in Arizona. But that’s ok, as it was still an amazing experience. Make sure you factor in extra pitstops to deal with baby stuff: different feeding schedules, nappy changing and all the rest. We kept distances short, maybe 20-40kms depending on the terrain. Neva was happy spending a few hours in the trailer each day, but it was important to make sure she had plenty of time to explore too. 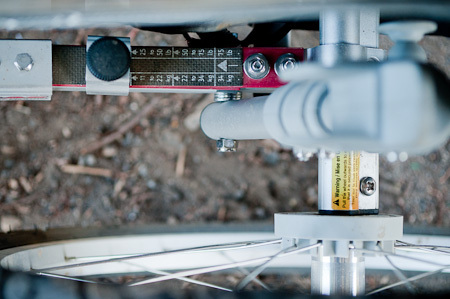 Fit both your bikes with trailer hitches so you can interchange the precious cargo. Kickstands are useful to make hopping off your bike easier to deal with any baby issues that may arise. A side mirror would be handy too, to help check what’s behind you when you need to pull out. Tape extra reflective patches onto the back of the trailer. We were kindly donated a bright orange workman’s jacket to make us more visible to the kamikaze truck drivers barrelling down to the Costa Rican border. Local buses can easily accomodate a trailer and a couple of bikes on their roofrack for a few pesos, if you need to make up some time. 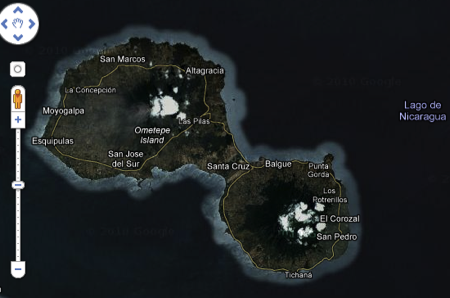 In a country like Nicaragua, you can’t control the environment around you in the way you may be used to at home. Trust that things will be ok; people will go out of their way to help you out. 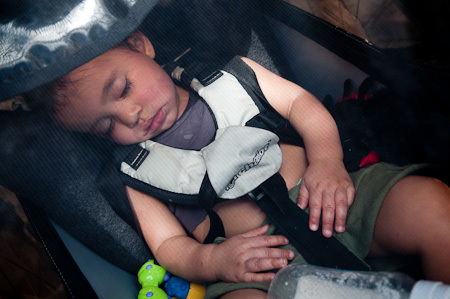 This is most likely obvious to everyone but me… Looking after a baby is an (almost) 24 hour undertaking, so pace yourself when you’re riding and save extra energy for the end of the day. I don’t know how Megan does it. She’s an amazing mum. Just go for it. 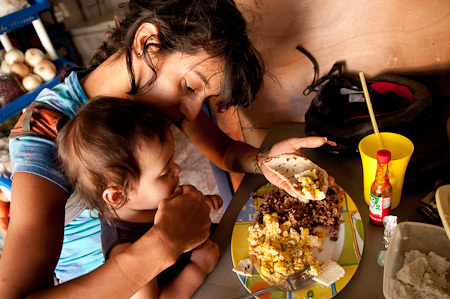 Cycling touring brings out the best in people around you, and touring with a child doubly so. 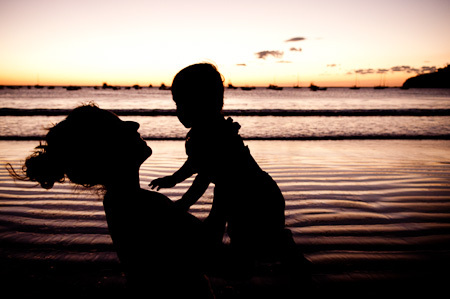 Travelling as a family really opens up a new world of cultural encounters. Neva. A very mellow little creature. Bless! I'm not sure how much she'll remember of this short journey, but perhaps it will play a part in shaping her into who she becomes. Megan works at Bike Hub Shop, online touring and commuting specialists based out of Flagstaff, Arizona. 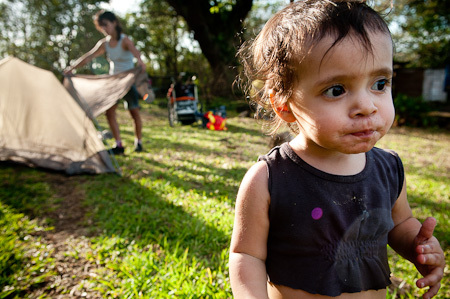 She’s knows her kiddy trailers inside out, so check out the site and drop her a line if you need some advice. 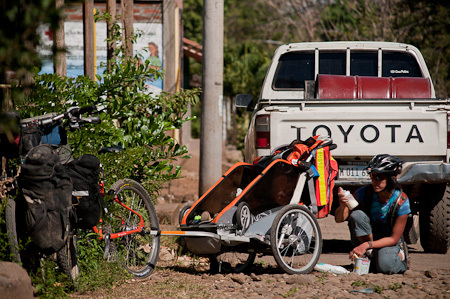 The trailer we used was made by Chariot, and included the front wheel kit for use as a stroller. 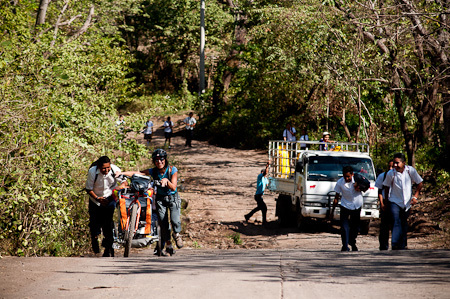 This entry was posted in Nicaragua on February 21, 2011 by Cass Gilbert. You’re certainly a trailblazer for your generation, Neva! Bridget – unfortunately we did use disposables. living here in flagstaff where it snows, it was difficult for me to predict the weather there. ultimately i came to the conclusion that it may be very humid, and the diapes wouldn’t dry quickly on top of the commitment of having to do laundry every day with our limited time frame. after being there, it was pretty warm, and drying would not have been a problem, however, we would have been toting extra dirty nappies, which you would need to have a place set up for. definitely doable for a longer term tour. Reuben – yes, packing up certainly does take longer, and there are multiple additional stops to fill her bottle or feed her while on the road. in this part of the country, considering the wildlife, you definitely cannot let her stray too far. 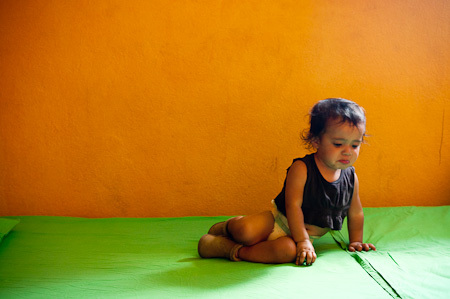 it is a delicate balance to let her explore her independence and new land and developing safety boundaries. Wow! Amazing pictures. Looks like a beautiful trip. Megan totally made me start thinking about a fun tour before she left but now the wheels are really spinning. So great to see you out there living life to the fullest. Cass, this looks amazing! Looks like you, Megan, and Neva had a truly remarkable experience. Thanks for the beautiful photos. Great post. 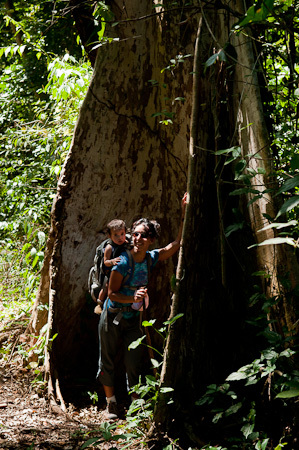 Very nice to see people having some adventure with their childs. I am curious on how you attached the trailer to the rohloff bike. Did you had any problem with the external gear mech? Megan and Neva are really inspiring! I don’t remember any serious issues with the setup. I think I just needed to space the hitch out a touch, so it didn’t rub against the EX Box. With a long skewer, this shouldn’t be a problem. You can only imagine the all the wonderful new memories burned into little Neva’s impressionable mind from an experience like this. 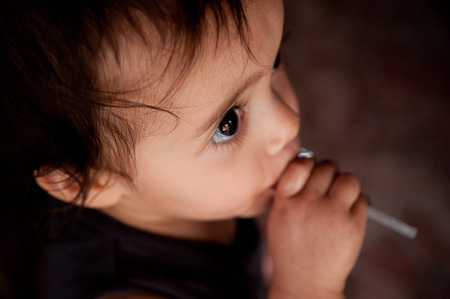 Part of a good foundation that will surely help her lead a richer life. Did you find good wild camping spots easy to find? Safe? Did you plan them all in before you left or was it more a case of stopping to find somewhere once you were done cycling for the day? Thanks so much – gorgeous photos. Yes, just sussed out camping spots as we went – though ahead of time, we did consider how far we could ride each day, and where we might get to. 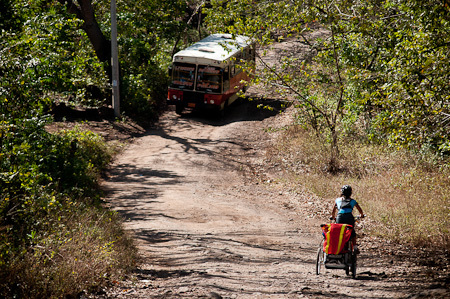 No safety issues to report in Nicaragua, especially in Ometepe. Usual prudence around beaches applies.